Mold in your home, whether there’s mold in your closet, crawlspace, or another area of your home, it’s not something you should handle yourself. Any amount of mold can be hazardous to your health. Our Frederick restoration company is licensed, trained, and equipped for mold removal, remediation, and inspection. Our goal is to not only properly remove the mold but also to find out why it formed and stop that from happening in the future. We may need to do mold testing to ensure we know what type of mold we’re dealing with. We collect the samples and send them out to a third-party testing lab for analysis. To keep mold spores from spreading, we’ll contain the area and place it under negative pressure with our powerful air filtration devices. This step is critical so that as we’re working and disturbing any mold spores, they cannot affect other areas of your property. It also helps to keep any mess down to a minimum for easier clean-up. When we’re in your Frederick home, we remove all of the materials that have mold on them, all the way down to the walls studs and subfloor if needed. When these materials are removed, we bag them, seal the bags, and dispose of them properly. Depending on the amount of material affected by the mold, we may need to utilize a dumpster to dispose of the material. After the materials have been removed, we have to clean any exposed material left. This can include walls, ceilings, furniture, and other items in the contained area. We use antimicrobials, biocides for mold, and HEPA vacuums in this process. 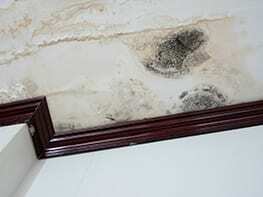 Any exposed wall studs or subfloor are sealed with a mold inhibiting product to ensure mold growth won’t return. Our Frederick-based mold cleaning process is very thorough and may include cleaning wall surfaces and ceiling multiple times. From mold remediation and removal to mold inspection and testing, our Frederick emergency restoration experts can handle it all and ensure that your home is once again safe for you and your family. Call now or contact us online to request service. We offer 24/7 emergency mold removal services and offer a one-hour window where we’ll head out to your property.